hennemusic hennemusic: Megadeth: Willie Nelson to play on new album? Megadeth: Willie Nelson to play on new album? Could Willie Nelson end up playing on the new Megadeth album? 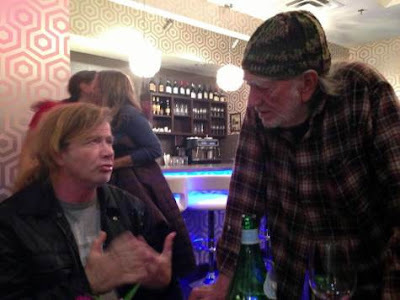 Dave Mustaine ran into the country legend in Austin, TX., Thursday night and posted a photo of the two. "Willie Nelson is in the restaurant I am eating at,” tweeted the guitarist. “I just met him! How cool is this???" Dave is in the city doing some house-hunting. The project will be released June 4 via Mustaine's new label, Tradecraft.